James Craven (Jim) Gambrell was born on 10 February 1848 in Anderson County, South Carolina. He was the son of Micajah (McCager) Gambrell and Frances Bagwell. James Craven (Jim) Gambrell died on 11 December 1928 in Honea Path, Anderson County, South Carolina, at age 80. Minerva Gambrell was born on 25 December 1839. She was the daughter of Micajah (McCager) Gambrell and Frances Bagwell. Mahala Gambrell was born on 2 February 1845. She was the daughter of Micajah (McCager) Gambrell and Frances Bagwell. Mahala Gambrell died in 1930. Baylis Earl Bagwell was born on 14 August 1845 in South Carolina.1,2 He was the son of Henderson Onie Bagwell and Margaret Stone.1,2 Baylis Earl Bagwell married Theresa Adeline Wilson. Baylis Earl Bagwell died on 8 September 1919 in Oconee County, South Carolina, at age 74.2 He was buried at Mountain View Cemetery, Seneca, Oconee County, South Carolina. Margaret Bagwell was born on 23 April 1855 in South Carolina.1,2 She was the daughter of Henderson Onie Bagwell and Margaret Stone.1,2 Her married name was Trussell. Margaret Bagwell married John Jasper "Squire" Trussell. Margaret Bagwell died on 8 December 1919 at age 64. She was buried at Honea Path Presbyterian Church Cemetery, Honea Path, Anderson County, South Carolina. 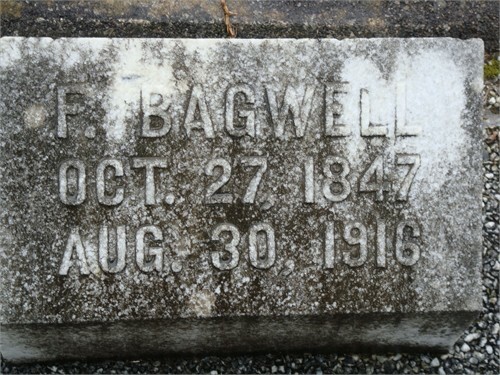 [S2230] F. Bagwell Grave Stone, Find a Grave, www.findagrave.com. 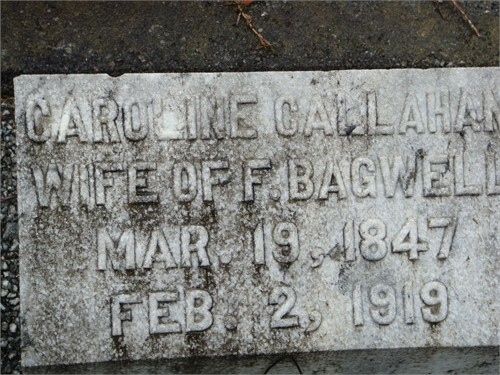 [S2229] Caroline Callaham Bagwell Grave Stone, Find a Grave, www.findagrave.com. William Lewis Bagwell was born on 19 September 1869 in South Carolina.1 He was the son of Frederick Bagwell and Samantha Caroline Callaham.1 William Lewis Bagwell married Nancy ("Nannie") Murphy in 1890.1 William Lewis Bagwell died on 18 November 1933 at age 64.1 He was buried at Mount Airy Baptist Church Cemetery, Anderson County, South Carolina. [S2225] Email from Curtis E. Bagwell dated May 2012 to Hunter Wayne Bagwell; Subject Line: Curtis E. Bagwell Ancestors. John Luther Bagwell was born in 1871 in Anderson County, South Carolina.1,3,4 He was the son of Frederick Bagwell and Samantha Caroline Callaham.4 John Luther Bagwell married Essie Jane Foster, daughter of Ranson Foster and Amanda Jones, circa 1892.1,2,3,5 John Luther Bagwell and Essie Jane Foster lived in 1910 in Liberty, Pickens County, South Carolina.1 John Luther Bagwell and Essie Jane Foster lived in 1920 in Liberty, Pickens County, South Carolina.2 John Luther Bagwell and Essie Jane Foster lived in 1930 in Liberty, Pickens County, South Carolina.3 John Luther Bagwell died on 25 October 1943 in Greenville County, South Carolina.4 He was buried at Enon Baptist Church, Pickens County, South Carolina. [S486] United States Federal Census, Washington, District of Columbia, Population Schedule: Liberty, Pickens, South Carolina, Emuneration District: 140, Supervisor District: 3, Sheet: 14A, Dwelling: 243, Family Number: 247, Date: 1910. [S487] United States Federal Census, Washington, District of Columbia, Population Schedule: Liberty, Pickens, South Carolina, Emuneration District: 155, Supervisor District: 3, Sheet: 9B, Dwelling: 154, Family Number: 162, Date: 1920. [S488] United States Federal Census, Washington, District of Columbia, Population Schedule: Liberty, Pickens, South Carolina, Emuneration District: 39-10, Supervisor District: 1, Sheet: 13B, Dwelling: 218, Family Number: 220, Date: 1930. [S2233] Monroe M. Bagwell Grave Stone, Find a Grave, www.findagrave.com. [S2234] Elizabeth Spearman Bagwell Grave Stone, Find a Grave, www.findagrave.com. [S2237] Norwood Bagwell Grave Stone, Find a Grave, www.findagrave.com. [S2231] O. W. Bagwell Grave Stone, Find a Grave, www.findagrave.com. [S2232] Evie Moore Bagwell Grave Stone, Find a Grave, www.findagrave.com. Vernice Bagwell was also known as Verna Bagwell. She was born circa 1909. She was the daughter of Ollie Wilton Thomas Bagwell and Evie Moore. Vernice Bagwell died in November 1980 in Greenville County, South Carolina. Sylvene Bagwell was born on 11 March 1910. She was the daughter of Ollie Wilton Thomas Bagwell and Evie Moore. Sylvene Bagwell died in August 1989 at age 79. [S553] United States Federal Census, Washington, District of Columbia, Population Schedule: Easley, Pickens, South Carolina; Emuneration District: 39-5, Supervisor District: 1, Sheet: 6A, Dwelling: 118, Family Number: 126, Date: 1930. [S2250] George A. Bagwell Grave Stone, Find a Grave, www.findagrave.com. Edward Foster Bagwell was born on 4 November 1894 in Anderson County, South Carolina.1 He was the son of John Luther Bagwell and Essie Jane Foster. Edward Foster Bagwell married Ruth Hinton. Edward Foster Bagwell died on 5 April 1944 in Greenville, Greenville County, South Carolina, at age 49. He was buried at Enon Baptist Church, Pickens County, South Carolina. Ruth Hinton married Edward Foster Bagwell, son of John Luther Bagwell and Essie Jane Foster. Donna Mae Bagwell was born on 20 January 1901 in Easley, Pickens County, South Carolina.1 She was the daughter of John Luther Bagwell and Essie Jane Foster. As of 22 June 1919,her married name was Dorr. Donna Mae Bagwell married William Carl Dorr on 22 June 1919. Donna Mae Bagwell died on 5 March 1996 in Easley, Pickens County, South Carolina, at age 95. She was buried at Enon Baptist Church, Pickens County, South Carolina. William Carl Dorr was born on 27 May 1898. He married Donna Mae Bagwell, daughter of John Luther Bagwell and Essie Jane Foster, on 22 June 1919. William Carl Dorr died on 14 March 1968 at age 69. Iber Luther Bagwell was also known as Freb Iber Bagwell. He was born on 13 January 1903 in South Carolina.1 He was the son of John Luther Bagwell and Essie Jane Foster. Iber Luther Bagwell married Mary Goode after 1930. Iber Luther Bagwell died on 22 September 1941 in Mobile, Mobile County, Alabama, at age 38. He was buried at Enon Baptist Church, Pickens County, South Carolina.